Let me be honest from the very start here. I am a gadget guy. I always have been and I always will be. I don’t mind spending money to have the latest toys, and I enjoy trying out new technology. I am also a huge Garmin fan. I have worked through generations of their wearable fitness devices. They have gotten progressively better over the years, and it has been fun to watch their improvement. I have also always been very impressed with Garmin’s tech support. With very little exception, I have had amazing experiences calling their tech support hotline. The people who answer the phones know the products well, can walk you through fixing what needs to be fixed, and if it can’t be fixed, they will replace it for you with minimal hassle. 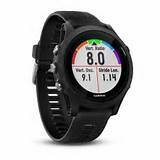 Depending on where you do your workouts, a good triathlon watch is going to be used to measure most of them. The easier this is, and the more accurate they are, the better information is that is available to both the athlete and the coach. The detailed information these watches record is invaluable for measuring and improving all three sports. When I heard about the release of the ForeRunner 935, I rolled my eyes a bit. Mostly because I knew at some point, I would be forking over some cash to get this thing in my hands, or more appropriately, on my wrist. As I do with any of the new technology I am interested in, I started looking for reviews of the products. Anyone who has ever googled for a review of a triathlon product has read or watched DCRainmaker. He does a great job reviewing and comparing all things triathlon. His review of 935 is here. A reader’s digest of his review, or at least the parts that stood out to me. It does wrist-based HR, which means NO MORE HR STRAP! Since you can wear it all the time, you can track your HR all the time! RoadID makes a product that goes on the strap of the watch. One less thing around my wrist! The next major step was to justify the purchase of this watch to myself. The biggest things that swayed me toward a purchase both has to do with the wrist-based heart rate. First, I have had a ton of chaffing and bleeding issues with the Garmin HR straps. Anything I could do to not have to wear a HR strap was huge for me. Second is the always on nature of the HR monitoring. The watch not only measure HR for workouts, but it measures your resting HR all the time, and also does it’s best to tell you how much sleep you’re getting. Resting HR is a huge indicator for how well your training is going. A rising resting heart rate can be an indicator of overtraining, or a leading indicator that you are getting sick. This is great information for both the athlete and the coach. For me, the positives on this new watch were pretty strong. The finances were a little bit questionable, but in the end, I did some checking for used pricing on the Garmin 920 I already owned. I figured I could get $175-$200 on eBay by selling my 920, so that took the edge off, financially. So far, I have been really happy with my decision, so you should definitely go buy one! This entry was posted in Dan Greer. Bookmark the permalink.